This is a very unique wedding band that makes a bold statement. One of the best features of tungsten is the ability to create a durable lifelong piece of jewelry that signifies not just love, but the strength and bond of a marriage, which at the core is stronger than the metal the wedding ring is created from. 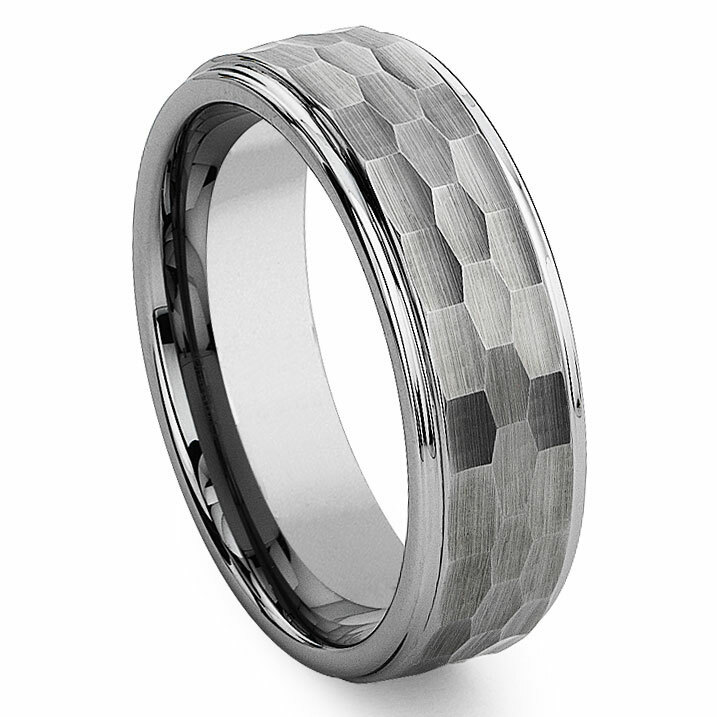 The hammer finish of the tungsten hammer finish wedding band gives the men's ring a sense of style and elegance while being rugged and strong. Perfect for every man, this ring will look great at work, while at home, out on the town, or even out on the lake. With comfort fit design this makes a very comfortable ring to wear. Even though this ring was way less expensive then the retail stores it beautiful and we get so many compliments in it! Classey and simple! I looked around at jewelry stores for a while... Nothing. I found Titanium Kay via Google. They had a bunch of nice rings and their prices were MUCH cheaper than retail stores. Stylish design and superior quality. If you don't like heavy, you might want to stay away from Tungsten and check out their cobalt rings. I have both, but my cobalt ring is my go-to ring. Comfortable, affordable and nice quality. Would recommend this seller. Fast delivery. This is the second ring bought from your company, the whole process was GREAT, prompt service, outstanding quality just a terrific experience. Would recommend this site to everyone. Thanks. Perfect size, perfect style and a perfect choice to replace my husband's original wedding band. The ring was much more than we expected! We loved it! It was a great purchase for a fantastic price!